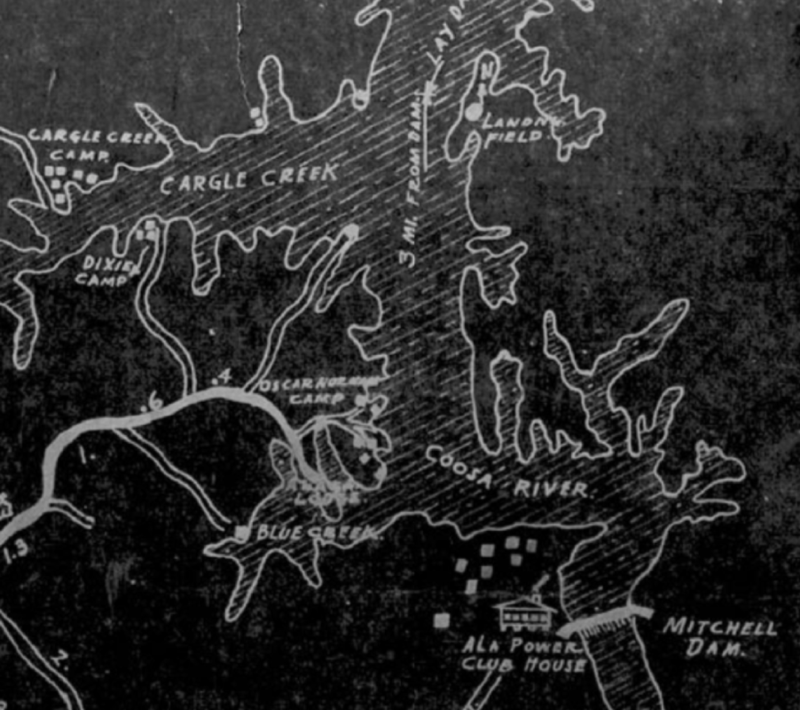 Before we get into this story, I want to let those who haven’t yet heard know that almost all the cabins that constitute the remains of Little Joe’s Fishing Camp are sadly no more. Their literal lakeside location (and in some cases over the lake) was fine when they were built so many years ago, but times have changed. So as we say goodbye to our friends on Fixico Creek (area 12), a special thanks is in order for one in particular. Ray Petty was the longtime “innkeeper” of Three Moose Lodge. In a past article he helped bring Little Joe’s back to life, and provided a most valuable contact with regards to the story at hand. Thanks Ray, and all the best to you and your neighbors on Fixico Creek. Harken back to an earlier newsletter article and a former landing strip that was indicated therein on an old map. To get a visual reference of this airstrip’s location, go to the HOBO website (www.lakemitchellhobo.org), under the More… heading select Newsletters, and then open the 4thQuarter 2013 issue. On page 4 you’ll find the map. On the Coosa county side and opposite the mouth of Cargle (Cargile) Creek you’ll see where the field, complete with a North arrow, was located. Our source for this story is Mr. Harris McGough (pronounced Magoo). Harris’ granddaddy was Thomas Dawson McGough Jr. Thomas McGough Jr.’s son (Harris’ dad) was Thomas Dawson McGough III or Tom to his friends. From talking to Harris it is apparent his dad led an interesting life. 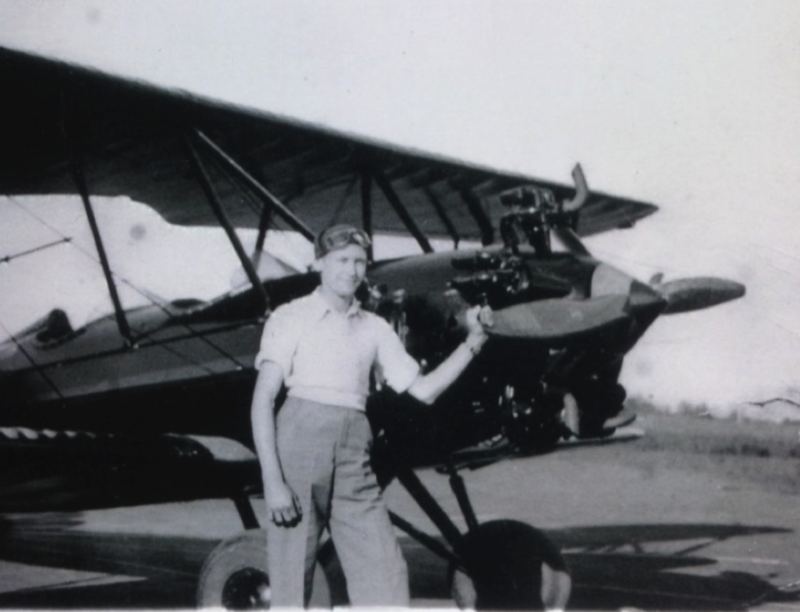 Tom was born in 1915, and by age 15 he bought his first airplane, possibly a Fairchild or a Piper J-4. From then on Tom owned several airplanes until, much later in life, the cost of keeping them insured became too much. Tom’s dad Thomas Jr. also flew, but Harris isn’t sure who taught whom to fly. ​When Tom wasn’t flying he had other things to interest him. Harris said his dad had the first Triumph motorcycle in Montgomery. However, motorcycles and planes were just hobbies; motorcars were to be Tom’s bread and butter, as he went on to own the Oldsmobile dealership (Capitol Motors) in Montgomery. Tom’s brother Frank (Harris’s uncle) owned Capitol Chevrolet in Montgomery, and at one time held a world speed record in a boat. Harris added his Uncle Frank’s boat racing was partially sponsored by Johnson Outboard Motors. Getting back to Lake Mitchell, the McGough’s had a place at the southern end of the lake on the Chilton county side. Harris remembers the location being called Mims Point. Directly opposite this location on the Coosa county side was Goat Rock, so called by Harris’s granddaddy because sometimes wild goats would be seen there. This large rocky outcropping or boulder, now somewhat submerged, can still be seen next to the steeply sloping shoreline. Today if you’re traveling south from Cargle/Cargile Creek by boat, just before you reach a small island and where Blue Creek joins the lake, there is a slough on the right. There is a solitary covered boat slip on the point now, as the adjacent land is in a floodplain and no permanent structures can be built there. Along the right or north side of this slough is where the McGough’s had their house, or actually houses, as they had three. There was also a small cottage for their handyman, Jesse Bibb. Jesse was like family to the McGough’s, and was a steadfast companion of Tom’s. ​Sometimes Tom would leave the big city of Montgomery for some R&R. Way before the Interstate system was constructed, he would forego the drive up Hwy. 31 and instead fly to Lake Mitchell. Passing over Blue Creek and being very careful to avoid the nearby towers and high voltage lines coming from the dam, he would drop down to circle the house until he got someone’s attention on the ground. Having been acknowledged, Tom would then cross over the lake and land on a grassy strip that Harris believes was largely cleared by Jesse’s efforts. This strip terminated just south of the entrance to what is now known as Airplane Slough. This was so far back in the day that few people owned a plane, and Harris said he never knew of anyone else using the field. After securing his plane, Tom wouldn’t have long to wait. Sometimes a family member, but usually Jesse, would get in Bessie, Harris’s grandmother’s boat, and make the short trip up and across the lake to pick Tom up. Harris has many fine memories of time spent on the Lake. Two things he remembers from inside their house was a big radio (think wooden cabinet filled with large vacuum tubes) and an ice box. The latter was not an electrical refrigerator but a true ice box, which necessitated a trip to the ice house before going to the lake house. The block of ice was usually put in the top section and the cold filtered down to keep the food fresh, while the melt water collected in a pan at the bottom. Across from the McGough’s place was Mitchell Lake Lodge. Mr. Mims was the caretaker for 5 cottages owned by Carmelo DiGiorgio, two of which are still standing. Mims lived in a house that was behind and further up the hill from the cottages, and the “Lodge”, even further back and higher still in elevation, afforded a grand view of the lake. This same Mr. Mims raised hunting dogs on part of the property. My Aunt Marie DiGiorgio, whose husband George was Carmelo’s youngest brother, remembered seeing nuns over at the McGough’s place. When I asked Harris about this, he kind of chuckled. He said his dad had a jeep (No Grand Cherokee or CJ5 here, possibly war surplus) and had a wreck one day. He was taken to St. Jude’s Hospital on Fairview in Montgomery for treatment. Tom received such good care that in appreciation he would sometimes invite some of the nuns up to the lake. As a youngster, Harris was surprised to find out that some of the nuns actually drank beer! ​Harris also mentioned Mr. Livingston, who had the Johnson Outboard Motor dealership in Birmingham. Mr. Livingston had three sons, Bill, Reggie and Eddie, who were contemporaries of Harris’s, and their place was originally on the water off of Blue Creek. Later they built a much larger house, as well as a dam that created Livingston Lake, a short distance away. The stream that issues forth from the dam flows into Blue Creek on the west side of what is now Alaga Landing. To finish our story and to emphasize just how small a world it truly is, Harris said he and his playmates would sometimes go up on the hill behind where Mr. Mims stayed and visit a cabin owned by a lady school teacher. Around this cabin they would catch butterflies. My wife’s parents, Vincent and Concetta Tamburello, bought this same cabin from the school teacher in 1953. Generations later relatives of the butterflies that escaped the grasp of those young boys still flutter by in the spring and summer.